Breckenridge Lift-Top Coffee Table Store, serve and showcase your favorite things with the Breckenridge lift top coffee table. Its textured antique white finish creates a vintage two-tone look that will endure for years. Store, serve and showcase your favorite things with the Breckenridge lift top coffee table. Its textured antique white finish creates a vintage two-tone look that will endure for years. Front (each): 17" x 16.5" x 6.5"
Side (each): 17" x 8.5" x 3.5"
I absolutely love it! Wheels to easily move table around living room and great drawer space. Best thing is the lift-top, which is why I bought it. I can watch my favorite show and eat comfortably in the living room. Was pleasantly surprised at the quality. Well built and sturdy. The castors (you can’t see them) make it easy to move. The storage is welcome in my smaller house. Definitely recommend. Absolutely love the table! Wood is sturdy and holds up well against the constant use of 3 children. So glad we decided on this coffee table! Overall impression is amazing service and quality. I’ve been back twice and will definitely come back again! Love love love these pieces! Functional, stylish, and affordable! The chair side table is a perfect fit for my living room, and it also had a hidden space for usb cords and plugs to plug in a lamp or charge your devices. 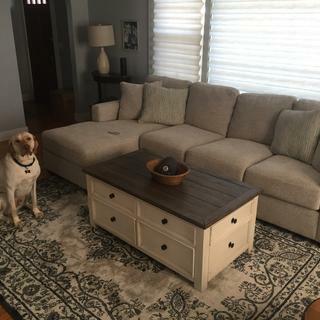 The matching coffee table is beautiful, has plenty of storage and the top lifts up so that you can do some work from home on your computer or have a place for your snacks when you binge watch your favorite show. I also bought a desk and matching hutch for my home office. Both have so much storage, are sturdy but light in weight and have a beautiful contemporary but farmhouse look. The service was wonderful from sales on the floor, answering all my questions, checking dimensions to make sure everything would fit to my vision and making it a relaxing and fun experience. My furniture was delivered within 2 days and they gave a great window of time for delivery for which they were able to call me a half hour before their arrival and we’re so efficient and courteous! Very versatile as a coffee table, desktop, or dinette table. I almost bought new chairs and couch prior to the purchase of my 5 tables. ( 2 end,1 chair, 1coffee and 1 sofa) The tables arrived and put in place in my family room. WOW ! What a difference, the tables transformed the entire room, the chairs and couches now look new. Highly recommend these tables to anyone looking for a reasonable priced, classic functionality set. 5 stars ! ! Just what I wanted but 50 characters is way more than is necessary to say that! Nice quality. Large amount of storage in drawers. Love the way this table looks in my living room. Also has a lift top too! I like the distressed look, but this had unnatural distress marks on it. There was also specs of paint dripped all over it. Seems a bit pricey for what I got. I am very disappointed with my recent purchase. There are Mark's all over the top and the slats are uneven. Hello Mark, we're very sorry to hear about this experience and would like to look into this for you. Could you e-mail your order details, contact information and a copy of your concerns to rfcare@raymourflanigan.com so we can better assist? Thank you! Is the top smooth? I will use the coffee table for paperwork. BEST ANSWER: It has grooves. I would not use it to write on, unless you put something flat under the paper. No. It’s ribbed and probably won’t be easy to write on. Can I use my credit I have with you to get this coffee table? BEST ANSWER: Hello Lisa! For assistance, please contact our online sales department at 866.383.4484, option 2. We would be happy to assist you! Can I order 4 replacement knobs for this piece? BEST ANSWER: For assistance with hardware replacement, please contact our customer care department at 866-383-4484, option 7!